As a player and as a coach, Rudy Soderquist was a proud Cobbler. He was a versatile and talented athlete, among the best in Rapid City history. Soderquist left the state for his college career but later found his way back home to coach the Cobblers. Basketball, football and track were sports in which Soderquist excelled. He earned 10 varsity letters at Rapid City High School, including four in track. For three seasons Soderquist was a mainstay in the basketball program of Coach Euc Cobb. During that time he averaged 15 points per game. Rapid City reached the Class A state tournament when Soderquist was a junior in 1936. He scored 21 points in the semifinals but the Cobblers were edged by Huron by a single point. Soderquist was selected to the all-tourney team. Minnesota was among colleges pursuing him. But Soderquist enrolled at the University of Iowa. He was a three-year starter at guard and during his senior season in 1942 he served as a co-captain. Iowa was coached by Rollie Williams. 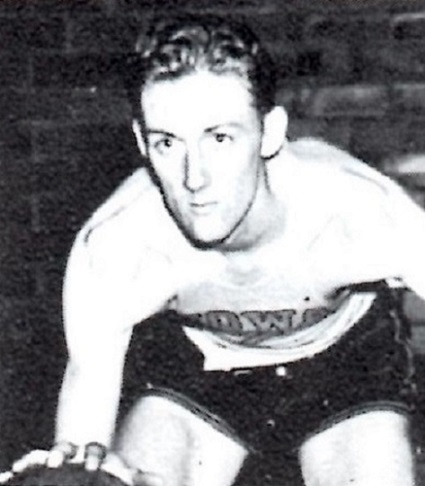 The Hawkeyes were runner-up in the Big Ten Conference in 1942 behind champion Illinois, a team that gained fame as “The Whiz Kids.” Soderquist was honorable mention all-Big Ten. Upon his graduation Soderquist entered the U.S. Navy. After fulfilling his military commitment he played a season in the National Basketball League with a team in Akron, Ohio. Then he embarked on a coaching career. Soderquist spent a year in Fort Madison, Iowa, and then returned to Rapid City where he eventually became basketball coach of his beloved Cobblers. Soderquist died in 1980. He and his wife Grace were parents of Craig, Diana and John.